Today, I am going to share my experience with the McVities Hobnobs Oat Cookies. In the recent times, there is a trend in the market for healthy food, a food which is rich in fibre and essential nutritions, and free from harmful substances for the body. McVities Hobnobs Oat Cookies are also a product in the same category. For the last five years, Oats have established themselves well in the Indian market because of their huge health benefits; therefore, many companies are launching products with Oats in them. These cookies also come in the same category of healthy cookies. The main ingredients of these cookies are Honey, Oats, Wheat fibre, wheat flour, sugar, edible vegetable oil, sugar syrup, wheat Gluten, common salt, leaving agents, emulsifier and acidity regulator. Mcvities claims that there are zero trans fats in these cookies. This is a good news because many people around the world are becoming ill by consuming trans fats. The company further claims that they use natural honey to make these cookies. As per the level of Cookies pack, there are 21.26% oats in each Cookie which is a good portion. If we go by the ingredients in these cookies, then these are healthy cookies and one should eat such cookies for good health. Now, the second most important question is their taste. In the past, I have tried few more similar biscuits and cookies. The problem with most of such healthy cookies is that there are not tasty; however, this is not the issue with McVities Hobnobs Oats Cookies. They are healthier and simultaneously tasty. I will definitely like to buy this Cookie again and there is price is competitive too. 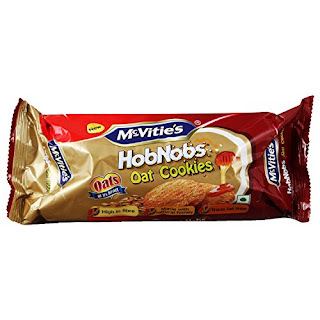 My rating for McVities Hobnobs Oats Cookies is 8 out of 10. Precaution- These Cookies can be a good option as a snack; however, overeating of them may be harmful.